2012/01/23 - Thomas Prescher TempusVivendi "DRAGON"
The dragon has a special place in the mythology of the Orient, uniting human characteristics with the beauty of nature. It is simultaneously a symbol and a legendary monster, taking part in human fortune and watching over the destiny of its rulers. This mythical creature has the power of magic; its wisdom supersedes that of all other creatures. It can defy all physical laws and transform itself into innumerable things: a creature as small as a tiny silkworm or a flying lizard large enough to cover the earth. These characteristics made the dragon king of the scaly tribes. Its body is a composite of the most terrible, imposing and powerful characteristics of all creatures. The scales of its body number nine times nine, the luckiest of numbers. Claws vary in number according to the dragon’s rank, the ordinary dragon having four while the one related to the Chinese imperial household possesses five. The dragon is usually accompanied by its favorite possession and its glory, the Chinese pearl or the Japanese hõju no tama. It is the jewel of omnipotence and divinity, said to contain the spiritual essence of the universe. The dragon’s breath is charged with fire and water that rise in spiral clouds of a beautiful pattern, said to be the manifestation of active cosmic forces. Legend has it that dragons live very long lives spanning thousands of years. When the dragon hatches from the egg, it starts life as a water dragon, which is the symbol for learning. Later it turns into the land dragon, the symbol of the statesman. Finally, it will become the dragon of the skies, which was exclusively the symbol of the emperor, the son of heaven. 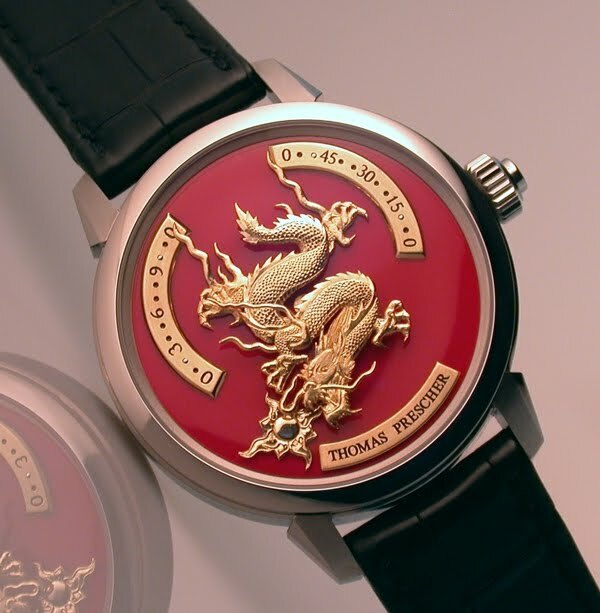 Today, the dragon is the national emblem of China and a symbol of the legends of the past. jumping hours (retrograde), minutes (retrograde).